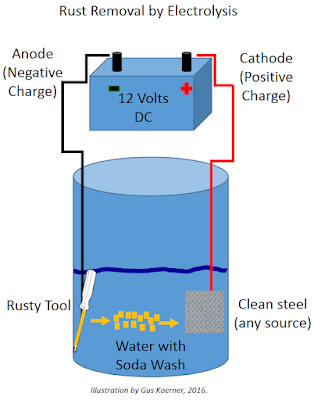 The following article details the process of using electrolysis for removing rust from tools. Credits are listed at the bottom of the article. I think you'll find it applicable reading for those flea market tools. Now here's the disclaimer: I make no claims as to the effectiveness of this process as instructed by the authors, nor am I responsible for any injury or otherwise negative consequences from employing their technique. Pay attention to any warnings in the article, and if you are not comfortable with the process, or cannot agree with the terms of this disclaimer, then do not read the following text and do not employ the technique. Thanks, Rick. Rust removal and antique tool cleaning is a very controversial subject among old tool collectors and users. Antique tool collectors tend to buy the finer examples of their tool of preference and most will not attempt to clean, fix or restore it in any way. Old tool users on the other hand tend to avoid the high priced "spiffy" tools in favor of tools that show their age. These tools are often found in grampa's basement or at estate sales and they may have either been heavily used or long forgotten and allowed to deteriorate with age. These tools need some form of restoration to return them to working condition. Electrolysis is the least destructive and most thorough method available to remove oxidation. Electrolysis removes no base metal and does not require grinders, wire wheels, scrappers, acids or sandpaper, and when done properly can remove rust and oxidation yet leave the appearance of "patina" so valued by the collectors. Electrolysis comes as close as possible to a compromise to the ideals of both categories of old tool enthusiasts. Don't let that description worry you because the actual process is quite easy to accomplish. Let's get to the stuff that makes it work. This system is so simple, easy to make and to use that anyone that collects or accumulates old tools for use or preservation should keep a small electrolysis system available in their shop. There are many variations of the setup but this is the simple, down and dirty method that requires a minimum of time, resources and understanding. After you have a system cookin' you can bone up on the whys and wherefores. You will gain the experience and understanding to begin creating a custom system based on your own needs and understanding. I'm no guru. I've tried it, I liked it, so I learned it. My background is/was industrial electronics so the theory wasn't new to me but the application was. I find it fascinating that something so simple can accomplish something so significant. The credit for the first post on this subject should go to Ted Kinsey. Larry Holland contributed a technical description of the electrochemistry at work. Many thanks to Ted, Larry and to Scott Grandstaff for their editorial reviews of this text and help in making it as accurate and to the point as possible. At the end of this document I've included a couple of url's on the subject. What I'll try and do here is cut to the meat of the subject and get you started so you can answer most of these questions on your own without having to ask "what if?" I'll also be glad to help anyone with questions by private mail at anytime. For those of you that like the technical side of things Larry Holland's description of the electrochemistry at work is included at the end of this page. 1. A two to five gallon plastic (non metallic) container. 2. A two amp or larger automotive battery charger with an ammeter. 3. A moderately flat piece of iron or steel. 4. A box of Arm and Hammer "Washing Soda" or "Baking Soda". 6. One to five gallons of water. 7. A pair of kitchen type rubber gloves. 8. A kitchen or similar sink full of warm sudsy water. 9. A non metallic 3M type Scotch Bright Finishing Pad product #10144NA. 10. A small tooth brush size stainless steel wire brush. 11. Paste or liquid, non-silicone, car wax. 1. The container can be any shape, size or configuration that is large enough to hold your tool completely submerged. Kmart, Walmart and many other department stores sell small, 6-7 inch deep, flat, clear plastic storage bins for $3 to $5. Restaurants and fast food chains often throw out five gallon buckets with lids that will work well. Small to medium trash cans are a possibility The key element here is non-conductive (plastic) containers. 2. Any power supply that provides a steady 6-24 volt dc current at 2 amps or larger should work well. Remember "this ain't rocket science." An inexpensive 10 amp battery charger with an ammeter can be bought for under $30 and is the best suited device for the job. The charger with an ammeter is almost essential. With heavily rusted metal getting good contact to the tool is not easy, and the ammeter is the simplest way to tell if you have got it. Avoid using the little overnight trickle chargers. 3. You need an anode for the (red) positive side of the battery charger. Best? A stainless steel kitchen pan lid because it is small, has lots of surface area and is usually cheap (if your wife doesn't catch you). 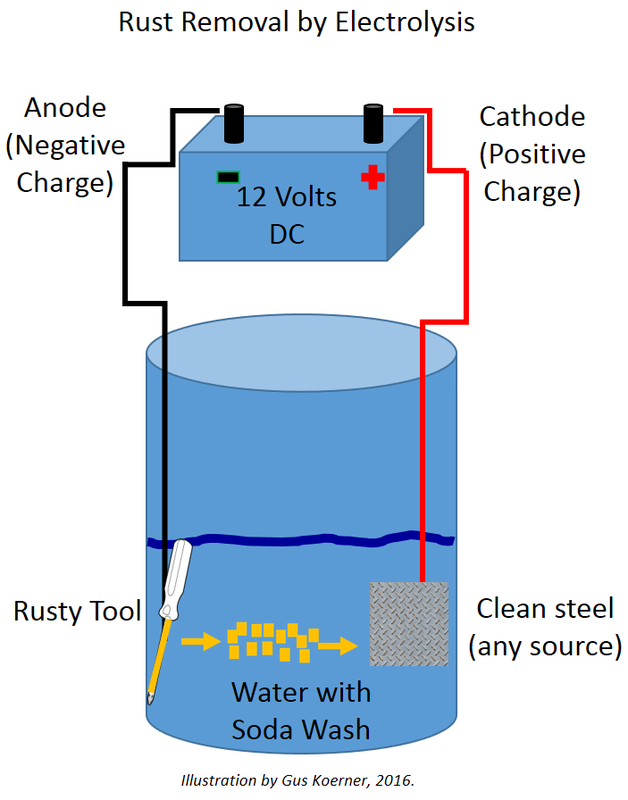 The anode is sacrificed and will eventually erode away to nothing. Stainless steel is best because it deteriorates the slowest, however one reader advised that using stainless steel creates a toxic waste, so you may want to stick with plain steel or iron, although this whole procedure is arguably potentially toxic. Anyway, most any steel or piece of iron will work. Its size in bulk is not as important as its size in surface area. Look for something about 5 inches square or what will fit your container and still not come into direct contact with your rusty tool. You can bend it, fold it, cut it. Again, "this ain't rocket science." Many kitchen tools are stainless steel, but perhaps it's best to use an old cookie sheet. The larger the surface area the more efficient your system will be. 4. You need to obtain one of two chemicals to add to the water. No complications here. Get yourself a box of Arm and Hammer "Washing Soda" or "Baking Soda." Both are readily available at your local food store. (TIP) "Washing Soda" is found with the clothes washing detergents. It is a yellow box with the familiar Arm and Hammer logo and is usually grouped with the fabric softeners and detergent enhancers. "Baking Soda" is also an Arm and Hammer product and can be found near the flour and baking supplies at your local food store. Chemically these products are different, but similar and both will work. If you have a choice between the two use the "Washing Soda." If you can't find it don't hesitate a second about using the "Baking Soda." Ask your wife about them. She probably has one or both in the house already. Repeat after me... "This ain't rocket science"
5. Using either "Washing Soda" or "Baking Soda" add about 1 tablespoon per gallon of water to your container. You now have an electrolyte solution. Although the solution becomes a nasty color and is filled with the residue of old rust you can continue to use it time and again, provided you keep your anode clean. 6. Add the appropriate amount of water to your container. The water should be deep enough to cover the tools you will clean but not so high that it will overflow when the tool is placed in the water. You now have a "vat." (TIP) The first time you fill your "vat" add water one gallon at a time. After pouring each gallon into the vat make a mark on the outside of the container with a bold black marker and label it 1, 2, 3, etc. for each gallon you add. In the future you no longer have to measure your water. Just use a garden hose and fill to the appropriate line. 7. After adding water and Soda powder the water is hard on your hands. Wear the rubber gloves while working in and with the electrolyte. This is a general precaution. The electrolyte is not an acid nor is it seriously bad to contact your skin but precautions are always best. 8. After removing everything that is not steel or iron from the tool, clean it in warm sudsy water using dish washing detergent. Remove any dirt, oil and grease that might retard the electrolysis. 9. You're looking for the 3M brand "non-metallic" gray finishing pad part No. 10144NA sold in the paint departments of hardware stores. Trust me and stick with this one. Cut each pad in half for use. (TIP) The 3M Scotch Brite pad is a pretty important piece to the process. It is used to remove the black ionized oxidation residue left by the electrolysis. You don't want scuff pads. 3M finishing pads are very sharp but on cast iron they break down quickly. These are advantages because it gets the heaviest concentrations of ionized oxide off quickly and by the time you get to the base metal it has worn down significantly and does not leave any marks behind on the metal. The metal does not look sanded, scuffed or abraded. If you use scuff pads of any make or model you will work at least twice as hard to accomplish half as much cleaning. Trust me. I've tried them all and you especially want to avoid kitchen scour pads. They're worthless. I found that once I tried the 3M finishing pad that it literally took all the work out of the final wash up and they were well worth the few cents extra I paid. You'll get two sometimes three planes to the pad and I cut them in half before use so double that. These are 3M "FINISHING PADS" gray in color, packed two to a wrapper and bear the part No. 10144NA. Cut them in 1/2 for use. They do have "grit" and they breakdown quickly thus they cut well but don't leave abrasions on the tools. It is used lightly and it wears out quickly. No metal is removed and the base metal is not scratched or abraded. In fact, you can clean down to whatever level of patina you desire be left on the tool. This is a subjective call on your part. How clean do you want it? 10. This small tooth brush sized stainless steel wire brush can be found at most hard ware stores for $2. It's used to get into the areas that your fingers and Scotch Bright pad won't fit. A light circular motion to the hard to reach area and the residue just falls off. 11. The final supply item is a product to seal and protect against future rust. This is a very subjective area so I'll make some points, a suggestion and leave it to you to develop a preference. A. Make certain the product does not contain any silicone. It plays havoc on your projects when you apply the finish. B. Avoid any product that contains an abrasive, like compounds and polishes. Most (but not all) of these are in paste form. C. Use a product that is readily available and easy to apply so you don't put off protecting your tools. D. The common practice of using WD-40 may be counter-productive. Based on the experience of other collectors I'm told that WD-40 has a high lacquer thinner content and may damage paint and japanning. My preferences are liquid "Kit" brand car wax (yellow bottle) and Tri-Flo penetrating oil. Both are common products nationally. 1. Put on your rubber gloves and wash your tool in warm soapy water and make sure to remove any grease or oil. These areas will not be de-rusted effectively if not thoroughly cleaned. 2. Fill your vat with the appropriate amount of water and add 1 tablespoon of your "Washing or Baking Soda" per gallon of water. 3. Clip the "positive" red lead of your battery charger to the object you've chosen for an anode and place to the side or at one end of your vat. It is not necessary that the anode be fully covered by the water but the more surface area that is available for the electrolysis to faster the process proceeds. Try to keep the red clip from your battery charger out of the solution to avoid it being eroded away with the anode. 4. For your first trial use an old junk tool or piece of metal. Clip the "negative" black lead of your battery charger to your iron tool to be cleaned and place it in the vat. Be certain that you have a nice tight grip on the tool with the black "negative" clip. Make sure the tool is fully covered by the water. So far I've not experienced a problem with allowing the black clip to be immersed in the solution. My clip remains intact and undamaged. (TIP) The tool should have a clear "line of sight" path to your anode. If the tool is large you may have to turn the tool occasionally to de-rust it evenly and completely. If your anode is a cookie sheet or something similar you can bend it into a shape that will conform to the shape of the tool being cleaned or the contour of your vat for faster operation. The tool should be fully submerged at all times. 5. Check that the tool and the anode are not touching and have about 2 inches or more separation between them. If placed too close together the current on your charger will be higher than expected. 6. Set the battery charger to its highest setting. Plug in your battery charger and note the amount of current indicated on the ammeter. There is no right or wrong amperage except that you must not exceed the rating of your battery charger. Once you have applied power don't put your hands in the vat. Always turn off the power before attempting to check your tool or make adjustments to your system. 7. You will begin to see bubbles form on the tool and rise to the top. Congratulations, you're in business. (TIP) A note about the gasses released during the process. Small amounts of hydrogen are released as a result of the electrolysis. You will notice while using your system just how small this amount of gas is. However, to avoid a concentration of hydrogen, never cover the vat while in use. Although minute this hydrogen is flammable and I would not operate the vat next to your water heater, stove or other open flame. 8. Once the rust has turned to a dark gray or black it's time to remove the tool and wash it in warm soapy water using the Scotch Brite pad to remove the residue. If the tool comes completely clean you're done. If not, place it back in the vat for another session. Dry your tool thoroughly and proceed to the next step. 9. A freshly electro-cleaned tool will immediately begin to rust again so it is important that you immediately treat your tool with your choice of wax or oils. If a brown or green "crud" begins to form and float to the top around the anode this perfectly normal. For as long as the anode lasts you will need to occasionally remove it and clean off the crud that forms on it. A putty knife works well for this. If your tool is painted or japanned do not leave it in the electrolysis vat any longer than necessary to achieve your goal. If the japanning is in poor condition it can start to turn loose if left for say, overnight. Unless heavily rusted most tools clean up in about two hours. If your tool has loose or moving parts to it you need to be sure they are securely attached "electrically" so they will cleanup with the rest of the tool. For an example just because the blade adjusting fork on your plane is pinned to the casting don't assume that it has a good electrical connection. There are several tricks to assuring a good electrical contact of moving parts. 1. Wrap a rubber band around the tool and the moving part to make a tighter connection. 2. Wedge a paper clip or other small object into the joint or hinge of a moving part to tighten the physical and thus the electrical connection. 3. Attach a clip lead ($2.99 from Radio Shack) or similar wire to the tool and the moving part to make a good electrical connection between them. If the current is too high and taxes your battery charger, here are a few things you can try. 1. Increase the distance between the anode and your tool being cleaned. 2. Reduce the amount of anode in the vat. Lift it out slightly. 3. Reduce the operating voltage or increase the current range of the battery charger setting. If you don't see an immediate reaction beginning in the vat when you plug in the battery charger, check all of your connections carefully. It can be difficult to get a good electrical connection on a heavily rusted tool. This is where the ammeter on your battery charger comes in handy. You can tell at a glance if you have a good connection to the tool. The bubbling action should start immediately after power is applied. If the tool in your vat appears to be eroding instead of de-rusting verify that you have the battery charger polarity correct. The tool must always be connected to the "negative" black terminal. On your first attempt I urge you to use a piece of scrap iron or other insignificant item to get the feel of how the system works. If you have a lot of cleaning to do and want to rev up your vat, try using a larger vat, place anodes on all sides of the vat and connect them all together to the positive (red) lead of your battery charger. Be sure your tool never comes into direct contact with the anodes while power is applied or you run the risk of damaging your battery charger. from contact with the electrolyte solution. The wax is easily removed with a warm hair dryer. For flat objects like saws try using towels soaked in the electrolyte on each side of the saw, hook the battery charger to the saw and place a flat anode on the towel atop the saw. This method is very inefficient and will require moving the anode around to various locations as the rust abates but it is still a means of cleaning a saw without removing the handle. You might also consider using a large diameter PVC or plastic pipe, stood on end with one end capped, as a vat to hang a saw blade or other long object into. Plastic rain gutter can also be useful for cleaning long objects. For anode material I shop the flea markets and second hand stores. I buy up all of their loose stainless steel pan lids for about 25 cents a piece or less. These can be flattened, cut, bent or mangled for any configuration. Avoid the aluminum lids, they're trouble with a capital "T". If stainless steel is not available an old baking sheet or similar iron or steel object will work well. It simply deteriorates faster. Again, keep in mind that stainless steel may create a more toxic result to deal with. As for the disposal of the nasty water after use, you can save it and continue using it by replenishing the water as it evaporates. Or, you can pour in on your lawn. I have dumped mine on the lawn all winter here in South Texas and the grass loves the iron rich water and does not seem to suffer from the other contents. What if you're using sodium chloride as the electrolytic salt. Think again and please don't do it. Nothing much changes at the cathode...but at the anode, chlorine is oxidized...that is, each chlorine ion donates an electron to the iron...thereby becoming a chlorine atom. Chlorine atoms combine to form chlorine gas (CL2). **Caution** Chlorine gas...in addition to being poisonous...facilitates combustion...just like oxygen. If you must use sodium chloride...use precautions. Make certain you have plenty of air circulation in a large environment. Don't take chances...it's far better to be safe...than sorry. Have fun with this and remember "this ain't rocket science." The solution The solution of sodium carbonate has two purposes. First, sodium carbonate is basic. The electrochemical reactions that occur at the rusted iron work best in a basic solution. Lye( sodium hydroxide) would work as well but it is less safe to use. Sodium bicarbonate, baking soda, may not work as well as sodium carbonate because it is less basic. The other purpose for the sodium carbonate is to make the water conduct electricity. When the salt, sodium carbonate, is dissolved in water it becomes sodium ions, Na+, and carbonate ions CO3-2 . These positive and negative charged ions carry the current in solution. Carbonate moves to the positive wire from the battery charger and sodium moves to the negative wire. This movement of ions through the solution results in a current, just like electrons moving in a wire results in a current. Pure water has a high resistance, about 20 million ohms per centimeter, and negligible current would pass without the sodium carbonate ions. The battery charger is a source of electrical current and voltage. Current is the flow of electrons in a wire. Voltage is a measure of the electron energy. So, the battery charger provides electrons with an energy of 12 volts at its negative lead and accepts electrons at its positive lead. The current indicated by the meter provides a measure of how many electrons are flowing. Current can also flow through water, if the water has ions dissolved in it, as provided by the sodium carbonate. **Caution** Hydrogen gas reacts explosively with oxygen (in the presence of heat) to produce water vapor. Take Michael Sullivan's advise seriously about shutting down the power before adjusting/removing the electrodes. If you are using electrolysis to remove rust...and have a considerable broth of bubbles...be very cautious. That broth is not the place to discard a glowing cigarette ember, lit match...or any other spark. Be warned...! !